Standard features. 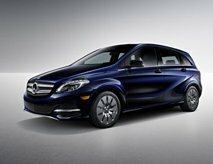 Mercedes-Benz has more standard features, while Lexus has more options, and the design of the Mercedes-Benz is associated with prestige. Fuel economy. The Mercedes-Benz GL 550 4MATIC® has better combined fuel economy than the Lexus LX. Safety rating. The Mercedes-Benz GLE 350 made the IIHS Top Safety Pick Plus rating. Luxury/Performance. From interior design to mbrace®, the Mercedes-Benz SUVs are made for top-notch luxury, performance, and safety. How much is a new Lexus SUV? The cost of a new Lexus SUV depends on the model and the features you choose for the vehicle. When you visit our dealership, we can help you to explore the options that we have on the lot, as well as the options that you can have custom ordered for your needs. Finding the SUV that meets your needs and expectations is important for us. We can find out your budget, learn about what options you must have and which ones are farther down the line to help you find a model and option package the works for you. 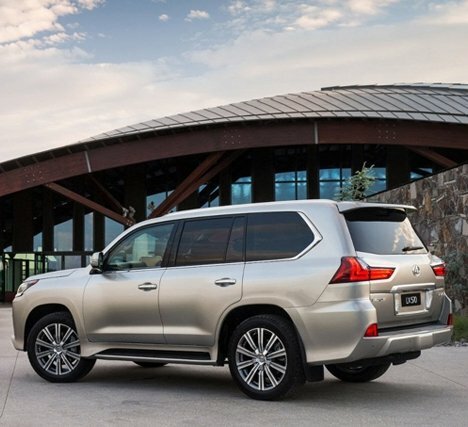 What is the largest Lexus SUV made? The largest Lexus SUV made is the LX570 model, which is comparable to the Mercedes-Benz GLS 550 4MATIC® in the GLS line. The side-by-side comparison of these two vehicles is pretty interesting. Both vehicles are V8s, but the Lexus is a 5.7L and the Mercedes-Benz is a 4.7L. When it comes to horsepower, the Lexus comes in at 383 and the Mercedes-Benz comes in at 449. The Mercedes-Benz combined fuel economy comes in at 16, and the Lexus is 15. The LX570 is the largest Lexus SUV. 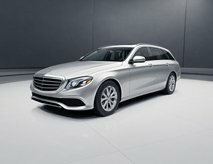 The comparable model, per http://www.mbscottsdale.com/clp-2017-mercedes-benz-gls-vs-2017-lexus-lx is the GLS 550 4MATIC®. This is why I did this comparison. I know the client had a question as to why I did this, so I figured I’d explain it and provide the link. When you compare the luxury of both, you will be surprised. 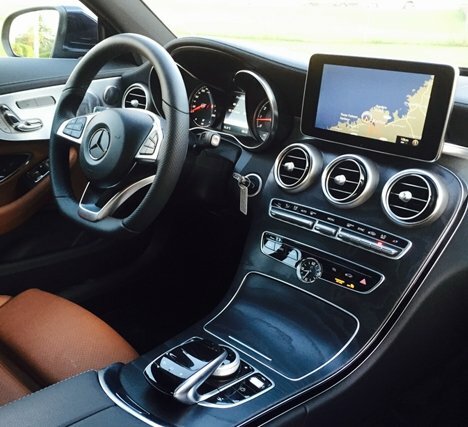 While the Mercedes-Benz only seats seven and the Lexus seats 8, the roominess that you gain from that one less seat increases the spaciousness. The Mercedes-Benz has 14 standard speakers, while the Lexus has nine. There Mercedes-Benz GLE SUV received the IIHS Top Safety Pick Plus rating for the 2017 model with frontal crash prevention. Some Mercedes-Benz SUVs have the 4MATIC® feature, which automatically sends torque to the wheels that need it when conditions turn slippery. Steering Pilot and optional Distance Pilot DISTRONIC® help to guide you as you drive, and Active Brake Assist helps to prevent crashes. 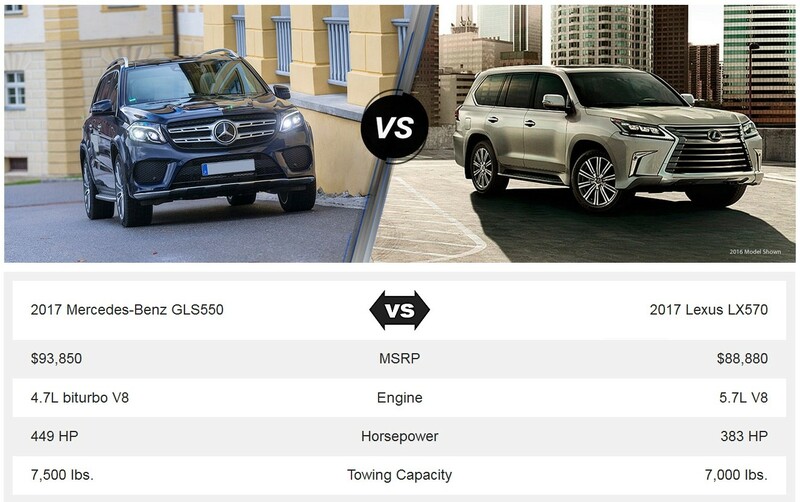 How does the Lexus SUV compare to the Mercedes-Benz SUV? Lookup design, safety, prestige and German made. Unlike the German-made Mercedes-Benz SUVs, there are fewer standard features that come on the Lexus SUV. This does allow you to customize the Lexus SUV a bit more than the Mercedes-Benz models. Typically, Mercedes-Benz SUVs have more torque and a higher horsepower rating than comparable Lexus SUVs. Additionally, Mercedes-Benz SUVs, such as the GLE 350, are often rated in the IIHS Top Safety Pick Plus rating. The Lexus RX 350 does not have that same safety rating. One thing that sets the Mercedes-Benz SUV a step above the Lexus SUV is the availability of four Mercedes-Benz mBrace® packages. These packages enable you to enjoy various features as the vehicle is connected to your smartphone. Remote start, remote diagnostics, alarms, vehicle tracking, and remote location finder are some of the features that you can find in these packages.